The Austin District Council of the Urban Land Institute (ULI Austin) named Republic Square as the 2018 Best Public Place last week! Given at the annual ULI Austin Impact Awards, this distinction is awarded to a completed public space that adds value to the community through its adaptability, frequency of use and magnetic quality. ULI Austin is an organization that boosts sustainable land use in order to bring together the Austin community. Following decades of planning and two years of redevelopment, Republic Square re-opened in the heart of downtown in 2017. This historic park provides residents with a thriving green space in the middle of a bustling business district. The park shines as an accessible site for various community events, like free movie showings, farmers’ markets and group fitness activities. 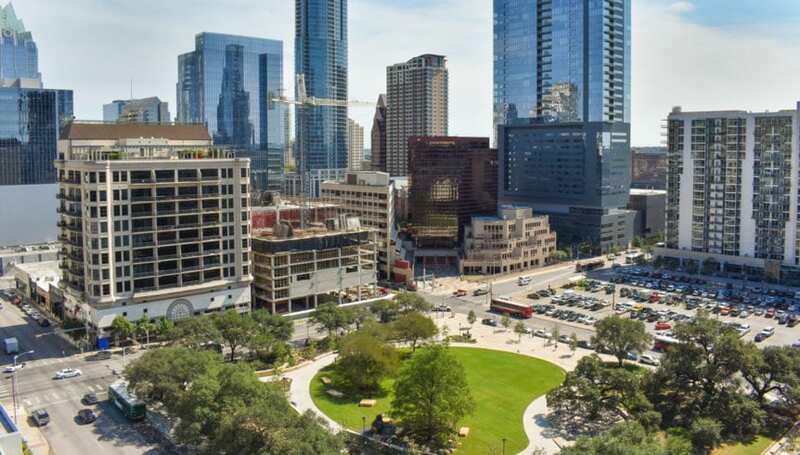 Through a partnership between Austin Parks Foundation (APF), the Downtown Austin Alliance (DAA) and the City of Austin Parks and Recreation Department (PARD), renovations began in 2016 to restore Republic Square to its original glory. During construction, APF oversaw the design and build of the updated park and raised $5.9 million to close the funding gap. After completion, DAA maintains the park and its programming while PARD oversees the operations. By combining its rich history and bright future, Republic Square has transformed back into a main attraction in Austin. We are grateful to our partners at the City and DAA, as well as all those that supported this important project with their time, expertise, funds and talents. Republic Square is now a shining example of how working together as a community makes great things happen. Thank you ULI for recognizing this historic project!